One of the biggest obstacles for a new fitness enthusiast to overcome is the soreness that comes with using muscles that haven’t been used in decades. During infancy, we’re learning to fire muscles all over the place. As we grow, spend increasingly more hours in flexion, and use less and less of our God-given ranges of motion, our bodies devolve from the machines of movement they were designed to be into blobs of tension, immobility, and sometimes pain. This is why it’s important to add foam rolling into your workout routine. If you’re feeling a little bit stiff and sore after your first few days of working out again, don’t despair. It’s totally natural. If you haven’t exercised in a while, then the several dozen squats, kicks, or push-ups that you did over the past day or two certainly placed a demand on your body that it hasn’t been used to. That means your muscles got a pump like they haven’t had in quite a while, unless you’ve been doing similar movements in your prior exercises or your daily life. Even if you already work out with some regularity, a significant change in your routine can be enough to leave your body nice and achy. Don’t believe me? Just ask any athlete how he or she feels when the strength and conditioning coach throws a new program into the mix. While some will tell you that the discomfort of soreness is nothing to concern yourself with, others might use those aching muscles as an excuse to skip a day or two or three, derailing a solid start to a successful workout program. While pain is nothing to trifle with, as it can clearly lead to or indicate injury, don’t use it as justification to bail out on training. I might have a solution for you that’s simple enough to use and seriously effective when properly used: foam rolling. When I first saw the foam roller in different exercise routines in the gym, I admit it… I wasn’t exactly impressed. The trainers who I saw back then were focused on using the foam roller as an instability device, training their clients to position the roller across or along the spine to perform different crunch-like exercises. Now while I absolutely recognize the worth of some core engagement exercises that rely on instability training, some of what I saw looked like little more than very poorly taught stupid human tricks. Fast forward a few years to the Russian Kettlebell Challenge Level 2 certification workshop with former world-class gymnast, powerlifting record holder, and ultra-marathoner Mark “Rif” Reifkind. Rif was teaching a section of the workshop that centered on the foam roller, and his SMFR approach to the roller was completely different from what I’d seen before. SMFR stands for Self-Myofascial Release, a rather long and fancy word for self-massage. As muscles work, they generate metabolic wastes, such as lactic acid. As those wastes build up in the muscles, they create a balloon effect, making the muscles swell up. While a larger muscle certainly might look cosmetically appealing, the congestion in the muscle tends to make its fascial envelope stretch taut, unable to contract more fully or relax more freely until the extra fluid is moved out. Light massage techniques, such as Swedish, serve to help push these metabolites out of the muscle bed, allowing for a quicker recovery and return to training. Muscles that “knot up” have trigger points. Trigger points tend to be indicative of more chronic problems, either in movement or posture or exertion. These trigger points can occur at different depths, depending on which section of the muscle is being engaged most with the movements or exercises that are being performed. The fascial membrane that surrounds muscles or the muscle fibers themselves can contract. When the body senses that the level of exertion is above the contractile strength or endurance of the myo (muscular) or fascial tissues involved, the body knots up those fibers as a survival strategy. The only problem with that strategy is that those knots inhibit movement and cause pain. What’s the Best Foam Roller? Foam rolling helps address the problems of muscle congestion and trigger points by mechanically pressing into the muscle. That said, there are different types of rollers that best address the different problems you might face. A smooth, soft roller is generally more effective for the more superficial trigger points and for moving the metabolites out of congested muscles. A roller with uneven surfaces, such as the RumbleRoller, is ideal for getting into the deeper trigger points and more deep tissue approaches. If you’re someone who tends to like deep pressure in a massage, go for the RumbleRoller. If deeper pressure tends to be too uncomfortable for you, go for the smoother roller. The important thing to remember in self-myofascial release is that foam rolling can feel uncomfortable at the outset. When you find the muscles that are congested or triggered up, the pressure of the roller may cause a bit of discomfort. Roll your body just to the edge of the discomfort. Focus on relaxing the muscles on the roller and breathe. As your nervous system responds to the pressure, it will learn to relax the trigger points on the roller and restore the contractile ability of the muscle. The first thing I did when I started foam rolling was to look for every place on my body that was sore and try to roll them out…Bad decision. The muscles that are the most chronically uncomfortable are usually those that are paying the price for other muscles that either aren’t firing enough or are so knotted up that they’re not allowing proper movement. The trick to using your foam roller in the most effective manner is really to look for the places in your body that aren’t obviously hurting but are restricting your movement. In one of my earliest video clips for Beachbody, I spoke about plantar fasciitis, pain along the underside of the foot. One of the key areas to roll when first trying to deal with plantar fasciitis should be the calf muscles. Using the roller, slowly go back and forth along the muscle, consciously trying to relax as much as possible and going as slowly as possible. When you find the “hot spots,” stay on them, relax some more, and go back and forth a few times until the trigger point releases. You might be pleasantly surprised to find out that the chronic pain in your foot actually had its roots in your calf! Ready to start giving your sore muscles the massage they deserve? 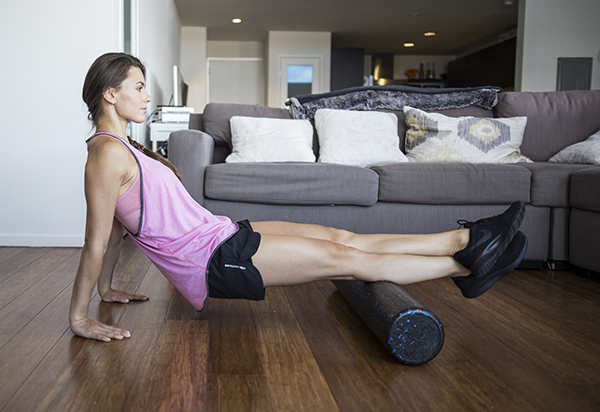 Check out some basic foam rolling moves and tips to make the most out of a foam roller.